SandReach versatility works great to improve torque while sanding with a pole instead of on your knees which can be painful and tiresome. SandReach works on all types of decking and is perfect for your residential DYI project or next commercial project. 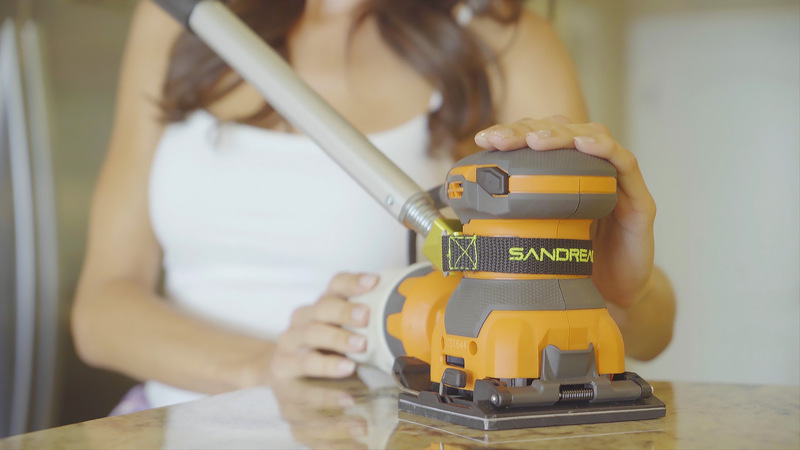 SandReach ability to work those tough angles on your baseboard and trim makes your next sanding project a breeze. Use SandReach to get those floor corners or over-head corners of your baseboard and trim with ease. SandReach gives you the extended reach you need to eliminate climbing up and down ladders while sanding. Simply attach to your extensions pole and reach those high or low siding boards to make it the easiest sanding experience ever. With SandReach getting those hard to reach places has never been easier. Have a high facia and eaves that would usually take climbing up and down a ladder and an entire day to sand? Reduce your ladder time and increase torque with SandReach. Whether you’re on a construction job getting ready to prep for painting or you want to sand your door casing and trim in a hurry for a DYI project, SandReach has you covered. Drywall sanding can be tiresome with a palm or hand sander. SandReach is a quick and safe solution for any commercial or DYI project that needs to get the sanding job done right. By far the best sanding accessory I've ever worked with. I never had to use a ladder once and my DIY sanding project took a tenth of the time to finish. I had an old sander and a new sander to work with and SandReach fit them both easily. I was amazed at how fast I was able to get everything done. I had a team of twenty contractors and we needed to sand an entire 100 foot x 9 foot wall within a day. Thanks to SandReach I was able to cut production time and ladder time in half making the job done in an under and hour. We sand all the time and finding out that we can use a pole instead of a ladder is one of the best solutions for us and our crew since slice bread. Thanks SandReach! I got this as a gift as I do a lot of DIY stuff around the house. I have to say I never thought sanding could be this easy and fast.